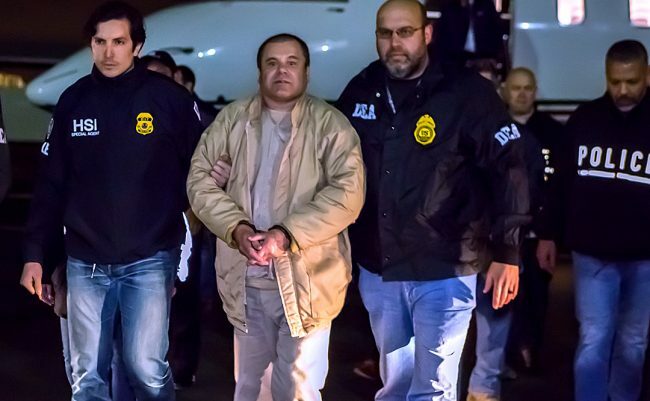 A spokesperson on Feb. 12, 2019, for the Eastern District US Attorney’s office has announced the jury in the Joaquin “El Chapo” Guzman has reached a verdict. El Chapo was convicted on all of the ten counts he was accused of. Prosecutors alleged El Chapo distributed and smuggled into the United States hundreds of millions of dollars of heroin and cocaine between the late 1980s into 2000s. He used tunnels, submarines, fishing boats, planes, trains, trucks, and cars to smuggle drugs into the United States from Mexico. He also hid drugs in shipments of fish, chile containers, and other concealed compartments. Prosecutors said El Chapo and his alleged co-leader Ismael Zambada García created the Sinaloa cartel from existing Mexican drug trafficking organizations. Sinaloa quickly became one of the largest narcotics smuggling organization in the world. In a superseding indictment, prosecutors said Guzmán and alleged co-leader Ismael Zambada García created the Sinaloa cartel in the early 2000s from an existing Mexican drug trafficking federation. The Brooklyn jury which consisted of eight women and four who remained partially sequestered and anonymous deliberated for six days and over 24 hours. The prosecutors presented the jury with the testimony of 56 witnesses, in which 14 worked for the drug lord. El Chapo did not testify at his trial. El Chapo’s trial took place under tight security with a significant media presence. Police snipers, bomb-sniffing dogs, and federal marshals carrying radiation sensors were present at the trial. 61-year-old El Chapo faces life in prison. He showed no emotion when sentenced. One Response to "El Chapo Jury Reaches a Verdict of Guilty on All 10 Counts"
I do accept as true with all the concepts you’ve presented for your post. They’re very convincing and can definitely work. Still, the posts are very quick for newbies. May just you please extend them a bit from next time? Thank you for the post.